For over 25 years NWF has been one of the leading adventure holiday companies in Scotland. We know that by the nature of our business we may impact on the wild places where we chose to adventure. We also accept a responsibility to strive to protect and allow future generations to enjoy our wild lands as we have. We believe that we constantly have to evaluate and adapt the way we operate to the demands of climate and environmental change, ensuring that we can continue to offer unforgettable adventures. Managing our resources is fundamental to being a sustainable adventure tour operator. We only offer private and small group trips - Maximum group size of ten for low environmental impact and client safety. We manage all our resources effectively to minimise our footprint - Avoid wasteful travel and plan itineraries carefully, all office staff either travel by foot or bike to work. We reduce, reuse and recycle in all aspects of our operation - From using recycled paper, avoiding unnecessary electricity & drinking water use. We use local support services ensuring that local communities benefit - Use of small independent accommodation and restaurants, local boatman etc. Allowing money to stay within the communities. We use local support services that share our commitment to the environment and communities. We operate a "leave no trace" policy - Understand and minimise impact, value the environment and make it hard for others to see and hear us. We adhere to the Scottish Access Code - Respect others, care for the environment and take responsibility. We aim to run an innovative, exciting and sustainable business in one of the most forward thinking and sustainable regions of Europe. A key policy is to support our local, rural communities and economies. Ever since 1986 we have built and developed excellent relationships with accommodation providers, restaurant owners, boatmen, crafts people, crofters and estates. Since our first trips they have all played a major part in helping us in creating outstanding holidays. We try to ensure that the money spent by us, or by our clients, helps support these people who guarantee to provide our clients with the best Highland hospitality. 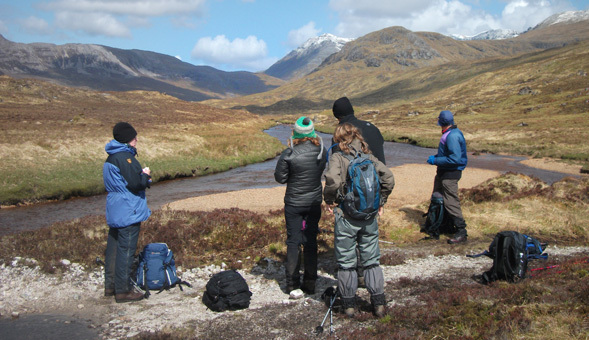 Our award winning guides are local to the Highlands and have been working for NWF for many years. Living and working within the local area they fully understand the issues that affect the communities and recognise the need to preserve the rich cultural and historical identity of the Scottish Highlands. Our guides are always looking to showcase the rich culture and history of the Scotland to our clients; like visiting a weaver on Harris or an evening of enjoying local music after a magical day in the hills.